Many years ago I attended Navy Officer Candidate School, which was at that time in Newport, RI. After being commissioned, I stayed on in Newport to take a class, as did my roommate Joan. It was fun exploring Newport, with its Colonial-era waterfront and the big opulent mansions of the robber barons, the places they called “cottages,” like The Breakers, Marble House, and Rosecliff. I was from Colorado and Joan from Texas. One night we got the urge for Mexican food. We found a restaurant in Newport that purported to serve Mexican food. We didn’t recognize it as such. So we learned early on to stick to the indigenous cuisine. Newport-style clam chowder served on the wharf tasted great. We could get a bucket of clams for not much money at a place called Salas on Thames Street. For a few bucks more, just down the street at the Boat House, we could get a lobster dinner. Then there were the big sandwiches the locals called grinders. For dessert, we’d go on “cream runs” to the Newport Creamery. One Saturday afternoon Joan and I were strolling through some shops on Bellevue Avenue, near the section of Newport with all those fancy houses. Joan knew I wanted to write mysteries. When she spotted the hat, she plucked it off the display and plopped it down on my head. I bought the hat. I still have it. The mystery writer’s hat is a gray wood fedora with a pleated black band, and a soft brim to tilt down over my face. I wore it for my book jacket photos, and a photo shoot for an article that appeared in a magazine. Sometimes at book signings, people will ask me where my mystery writer’s hat is. I haven’t worn it in a long time. But I took it out of the closet so I could take a picture of it, along with some of the other mystery writer’s hats I have. Mystery writers wears lots of hats – the sit-at-the-computer-and-write hat, which may be invisible but frequently has me running my hands through my hair. Maybe there’s some sort of inspiration in that particular act. There’s the booksigning-and-convention hat, which is where I’ve worn my fedora in the past. Then there’s the research hat. 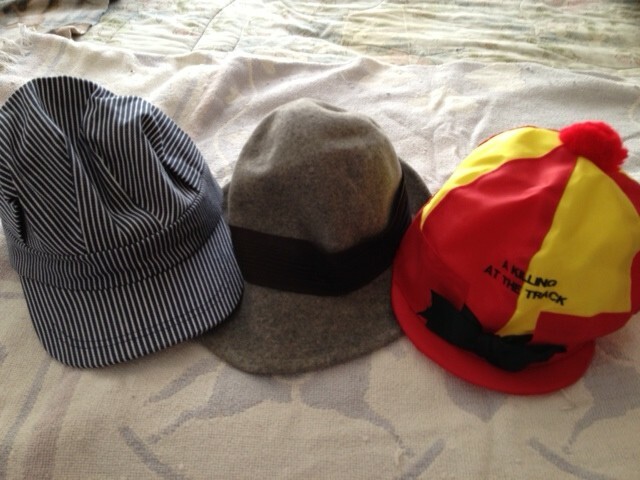 In the picture, the hat on the right is one I had made while I was writing the ninth Jeri Howard book, A Killing At The Track. It’s a horseracing book, so I’d immersed myself in the Sport of Kings. Since one of my characters was a woman who trained racehorses, I located a woman trainer and followed her around the track, soaking up material and local color, such as that Thoroughbred who was about to bite me because I dared to pet his companion animal, a goat. “Yes, that’s it!” I said. She steered me to a woman at Golden Gate Fields who made helmet covers, and I had this one made, in red and yellow, the colors on the book cover. I even wore it at signings. The current research hat is the one on the left. It’s a train engineer’s cap. I’m working on the train book – Death Rides The Zephyr. I’m immersing myself in this history of that particular train, poring over timetables, menus, diagrams of railroad cars, old photographs. And I’ve been riding historic trains, imagining what it would have been like to take a cross-country trip on a sleek stainless steel superliner, eating off railroad china in the dining car, gazing at the beautiful scenery from the Vista-Dome. Nothing like a good engineer’s cap to get me in the mood to write a train mystery. And just maybe, when I start doing signings for the forthcoming book, What You Wish For, I’ll start wearing that mystery writer’s hat again. I got what I wished for, and worked for. I’m a mystery writer.